I don't have pizza very often anymore. This recipe curbs my pizza craving and is a hit with the whole family. It's also much healthier than the real thing. 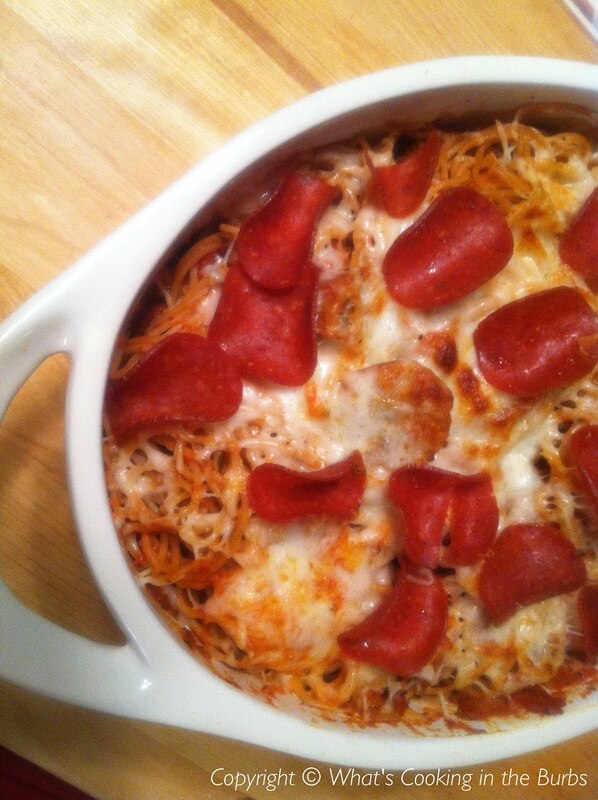 You can add whatever ingredients you would like but I used turkey pepperoni and turkey Italian sausage. It was fantastic! In a large pan, heat olive oil over medium heat. Add sausage and onion and cook until sausage is no longer pink. Add garlic and saute about one minute. Add pasta sauce and cooked spaghetti. Add half of the pepperoni and add to pasta mixture. Stir in half of the cheese. Pour pasta into a large baking dish. Top with the rest of the cheese and pepperoni. Broil for about 5 minutes or until cheese is brown and bubbly. Let cool slightly before serving. Enjoy! I just bought all the stuff to make pizza spaghetti. Not quite the same recipe but almost.. I'm glad to hear it was a hit :) Can't wait to make it now! Love that you have the WW PP on this recipe. And, it looks delicious! Fantastic Recipe! Love that you list the WW Pts too :) Pinning! This looks delicious! I think I will add it into my menu for next week! I have a Pinterest party going on and would love to have you share this if you have a minute! This is something new and it sounds delish! This is one of the best ideas ever! And it only has 6 WW points! Wow! This looks like something the whole family would enjoy. Pinned and featuring tonight - thanks so much for sharing at Mom On Timeout!